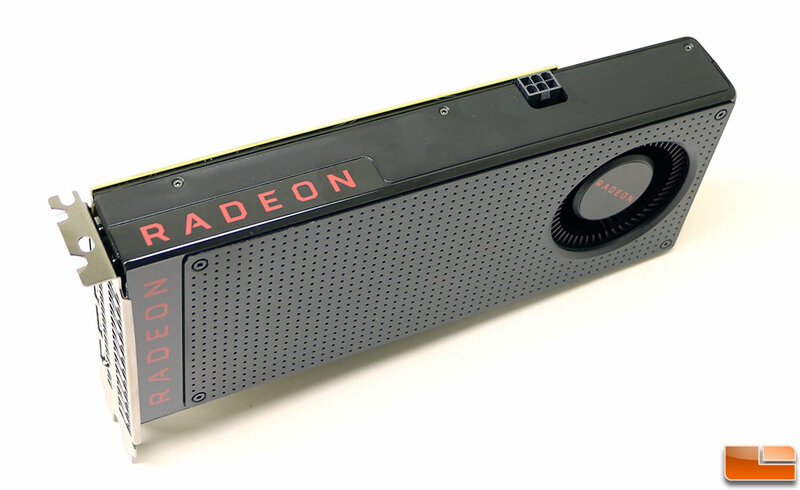 The AMD Radeon RX 480 has already proven itself to be an affordable solution for 1080P and 1440P gaming displays in our launch review and then later when we looked at 4GB versus 8GB frame buffer performance. We don’t have a proper Data Acquisition (DAQ) tools needed to measure board power, so we’ve had to sit on the sidelines for the Radeon RX 480 powergate debacle. It appears that the Radeon RX 480 is exceeding the 75W power limit over the motherboards x16 PCIe slot. AMD will be providing a software update in a driver that implements a fix and there will be an update on its progress tomorrow (July 5th, 2016). 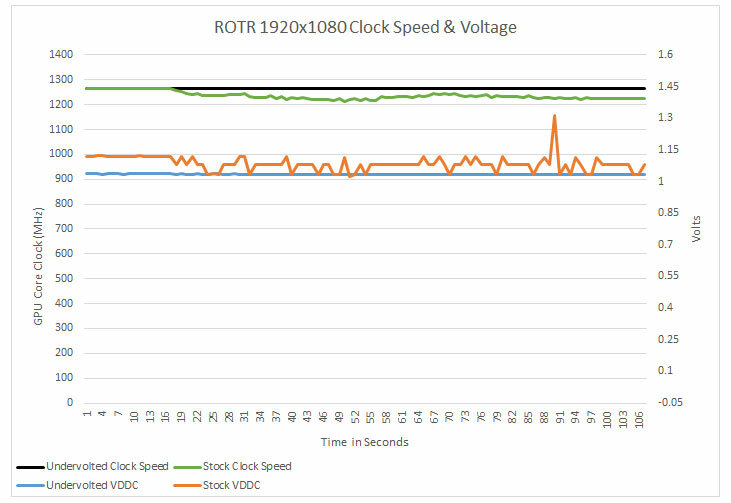 While we wait for AMD to come up with a fix for the Radeon RX 480’s power woes we ran across an article by Keith May over at WCCFTech about how he was able to undervolt the Radeon RX 480 and improve performance. 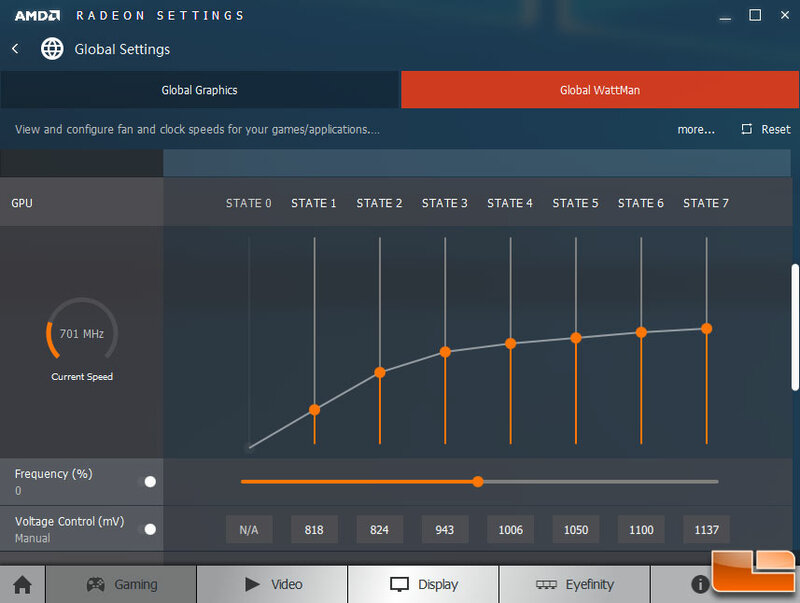 With the AMD Radeon RX 480 exceeding ‘safe’ power levels in stock form at default clock speeds, proven by Ryan Shrout over at PC Perspective), we figured we’d give undervolting a shot. To undervolt the AMD Radeon RX 480 you can go into AMD Radeon Settings and under the Global Wattman settings you can control the voltage levels for the GPU at seven different power states. When playing games you are usually at the highest 2-3 power states, so to keep things simple we’ll just be adjusting the two top power states. By default Power State 6 is 1100mV (1.1V) and Power State 7 is 1137mV (1.137V). We are simply going to lower those to 1050mV. With Voltage Control set to manual we were able to type in the voltages that we wanted and now we have PS5, PS6 and PS7 all running at 1050mV. We tried to go down to 1006mV, but the system crashed and rebooted. Just like overclocking, undervolting too much will result in system instability and could possible cause crashes. 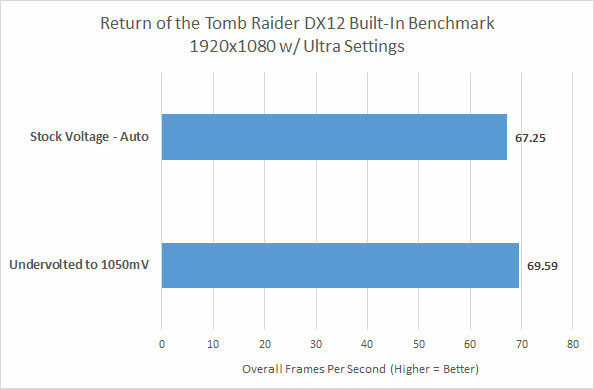 When running the AMD Radeon RX 480 8GB reference card at default settings (1136mV) we had an overall score of 67.25 FPS when we averaged our runs together with the built-in DX12 benchmark for Rise of The Tomb Raider. When we repeated the test we found that our performance and undervolted Power State 6 and Power State 7 to 1050MV we found that the performance went up! We went from 67.25 FPS to 69.59 FPS. This 3.5% performance gain isn’t massive by any means, but we were able to get a measurable difference in performance and that is exciting. 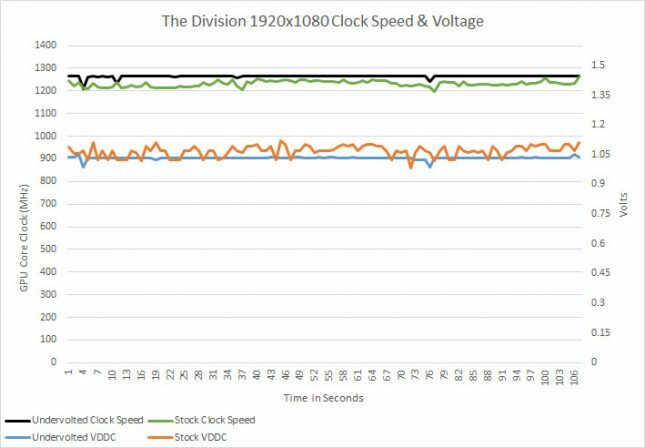 By taking a closer look at the clock speeds and voltages on the cards we can see why we are getting better performance while gaming. At stock settings the AMD Radeon RX 480 runs at it’s peak boost clock speed of 1266Mhz for about 18 seconds on this particular game title before retreating down to as low as 1211Mhz for the rest of the benchmark run. The voltage on the card was reported by GPU-Z as being 1.1187 Volts for most of the first portion of the run before dropping down and jumping around for the remainder of the benchmark. Note that one of the polling times saw the VDDC running at 1.3125V, which is a pretty high spike that is well over the 1136mV the card is set to by default. By undervolting the card we were able to keep the clock speed at the top boost clock of 1266MHz for the entire duration of the benchmark run and that meant better performance, lower GPU temperatures and less power consumption. 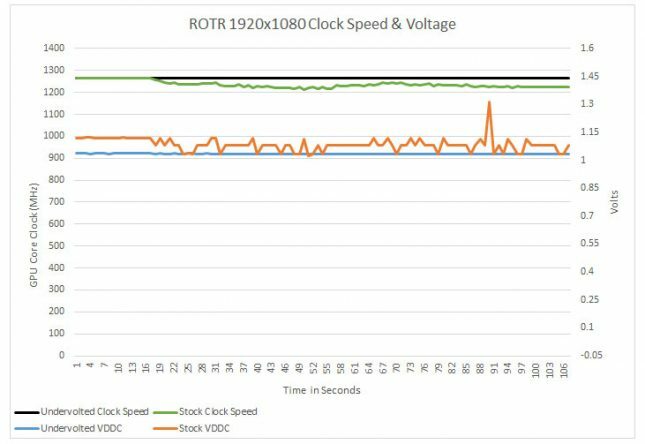 We noticed 10-30W power reductions at the power outlet meter by undervolting the Radeon RX 480! A one voltage fits all approach obviously leaves some room for adjustment! In The Division we again found that manually undervolting the AMD Radeon RX 480 improved performance. On this game title we were seeing a 4% performance improvement by simply reducing the voltage in AMD’s WattMan app! With the Radeon RX 480 graphics card undervolted it remained at 1266MHz for most of the benchmark run whereas the card with all default settings in WattMan only managed to hit 1260MHz at the end of the benchmark run. 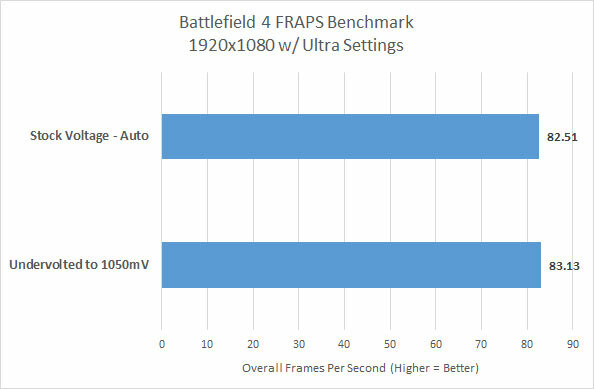 Not all game titles we tried out had performance differences of over 1 FPS on average and Battlefield 4 was one of those titles. We still saw performance increased thanks to undervolting, but it was a 0.8% performance increase. 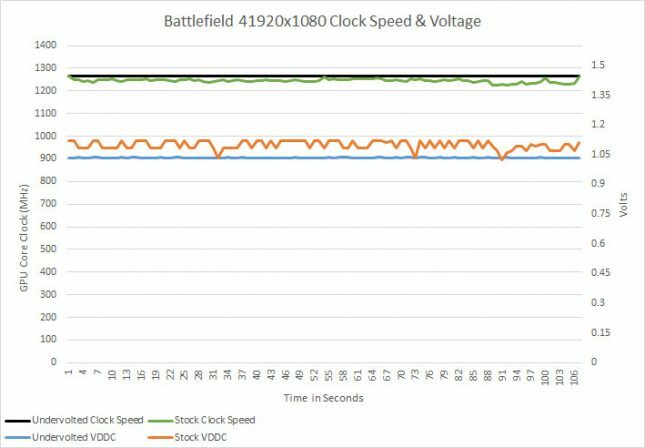 This is because in Battlefield 4 the clock speeds are very close to one another. We averaged 1266MHz with the undervolted card and 1245MHz with the Radeon RX 480 running default settings, so there is only a 1.7% average clock speed difference. The biggest improvement in Battlefield 4 was at the power outlet where we saw solid 10-20 Watt power decreases thanks to the undervolt! It appears that AMD was pretty easy going with regards to the higher P-state voltages as we were able to reduce ours from 1.15V to 1.05V with the new AMD WattMan software and still had full gaming stability. By lowering the power level down it increases the efficiency of the GPU and for gamers that means you get to hold the boost clock speed longer and get better performance and use less power. Having the ability to turn all the P-State knobs is pretty nice and we are already seeing the new WattMan software paying off. Being able to get a small performance boost while lowering the power consumption and heat levels was pretty nice and it’s something you might want to try out if you happen to have an AMD Radeon RX 480 graphics card. 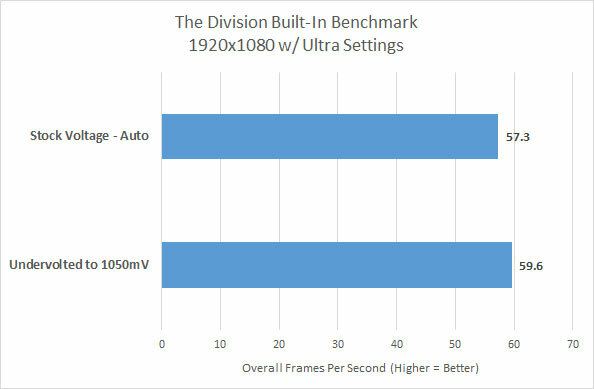 It’s easy to geek out and enjoy seeing performance go up in benchmarks while seeing double digit Wattage drops at the wall! As usual be sure to let us know if you have any questions and Happy 4th of July to all those in the United States! If we get some free time we might try raising the GPU clock and overclocking with the lower voltage to see what happens to performance!